I've been on something of a point-and-click adventure game kick recently, and let me tell ya it's opened up my eyes to a whole new side of gaming I didn't have a ton of experience in. Focusing on great writing and fantastic stories, they offer up a great alternative to the hustle and bustle found in so many games these days. Luckily, you can keep the adventure game engines churning, too, with a new copy of The Low Road from XGen Studios! 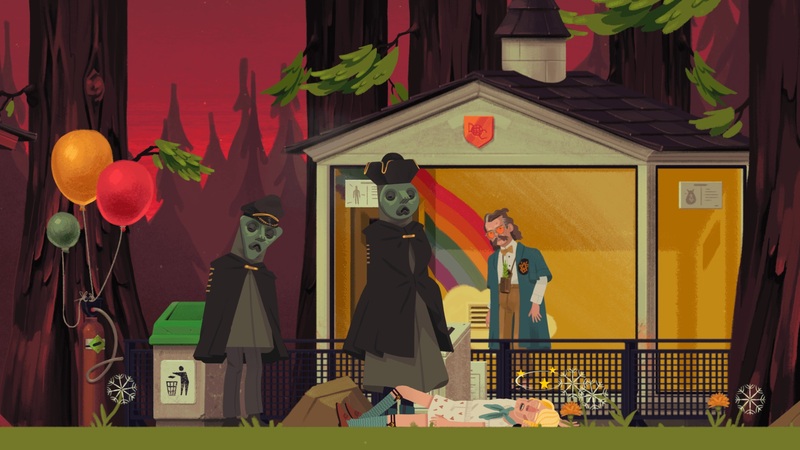 Set in the 1970s automobile world, The Low Road is a point-and-click graphic adventure which follows a team of corporate spies dedicated to the protection (and appropriation) of game-changing industry secrets. Sporting a unique visual style inspired by gouache paintings and a pulsating experimental score, The Low Road will captivate players though intricate puzzles, branching moral dilemmas, and a quirky cast of memorable characters. To get your hands on this visually stunning game, comment below with a time you had to get sneaky in order to take something you really wanted. When I was a kid my friends and I stood on one another's shoulders, put on a trench coat and bowler hat, and went to the bank to get a loan. It didn't work, but we did fool the guy at 7-11 and bought some cigarettes, instead. Close enough. We'll randomly draw seven winners on Tuesday, September 4. Make sure you comment using a Dtoid account that has your current email address on file. It's not very spy-like to not provide an email address when applying for your spy badge. The Low Road is available now on Steam and Nintendo Switch.